This feature highlights a number of meteor showers, comets and asteroids which are visible during the month of March 2010. Mars is still the dominant planetary object in the evening sky though it it being joined by Venus in the early evening hours and Saturn in the late evening. Mercury – The innermost planet spends most of the month too close to the Sun for most observers. During the last week of the month, Mercury quickly climbs out of the evening twilight sky on its way to its best evening apparition of the year in early April. By the end of March it can be found a few degrees to the lower right of Venus. Venus – Here in Tucson, Venus is relatively easy to see thanks to our clear sky and lack of obscuring trees. For most people, the planet is still a difficult sight requiring a clear western horizon. At the start of the month, it sets a little less than an hour after the Sun. This gap grows to ~1.6 hours by the end of March. Not to worry though, Venus will be much higher and easier to see over the next few months. For northern observers, it will be highest in June. The best time for southern observers will be August. Mars – Mars was at opposition (the point opposite the Sun in the sky) on January 29. Opposition means Mars is closest to Earth and at its brightest. This month the Earth and Mars continue to move further apart. As a result, Mars will quickly fade from magnitude -0.6 to +0.2. Still it will be a brilliant red beacon high in the eastern sky right after sundown outshining all but the brightest few stars. Note that unlike the stars which twinkle, Mars shines with an unwavering red glow. Saturn – Saturn is at opposition in Virgo on March 21 when it will shine at magnitude +0.5. Telescope users should note that Saturn’s rings are still within a few degrees of edge-on. Jupiter – Jupiter is too close to the Sun for most observers. It will once again be visible in the early morning hours next month. March marks the month with the lowest level of meteor activity. The year is usually split in 2 with January through June having low rates with few major showers while July through December (really through the 1st week of January) have high rates with many major showers. Sporadic meteors are not part of any known meteor shower. They represent the background flux of meteors. Except for the few days per year when a major shower is active, most meteors that are observed are Sporadics. This is especially true for meteors observed during the evening. During March, 8-10 or so Sporadic meteors can be observed per hour from a dark moonless sky. No major showers this month. The nucleus of comet Wild 2 taken by the Stardust spacecraft. Credit: NASA/JPL/Stardust team. This year Wild 2 reached perihelion on February 22 at 1.60 AU while closest approach to Earth will occur on April 5 at 0.67 AU. Though the comet will only reach a brightness of magnitude ~9.2 to 9.5 in March, it will remain brighter than magnitude 10.0 from January through May. At mid-month the comet a morning object located in Virgo at a distance of 1.61 AU from the Sun and 0.71 AU from Earth. These two long-period comets should become brighter than magnitude 10 this month. Both were found by components of the Catalina Sky Survey, one in Australia and the other in Arizona. Comet McNaught was discovered by Rob McNaught on the night of May 27, 2009 deep in the southern sky. The discovery was made with the 0.5-m Uppsala Schmidt telescope from Australia as part of the Siding Spring Survey (one of the three Catalina Sky Survey components) for unknown asteroids and comets. At the time, the comet was a faint 17th magnitude. With perihelion on April 30 of this year at a distance of 1.42 AU from the Sun, C/2009 K5 is now bright enough to be seen in small backyard telescopes from dark sites. During the month it should be as bright as 9.0 to 10.0 magnitude as it moves north while paralleling the Milky Way in Aquila. The comet will be a morning object all month long. At mid-month it will be located 1.57 AU from the Sun and 1.67 AU from Earth. Comet Catalina was first spotted as an asteroidal object by observers at the Catalina Sky Survey proper on July 27, 2009. At the time the comet was 19th magnitude and probably just barely visible in images taken with the 0.68-m Catalina Schmidt telescope. This comet is currently only 11th magnitude. The comet should rapidly brighten as it approaches its March 24th perihelion at a distance of 0.70 AU from the Sun. At that time the comet may be as bright as magnitude 9.0 as it cruises through the Milky Way constellations of Vulpecula, Cygnus, Lacerta and Andromeda in the morning sky. 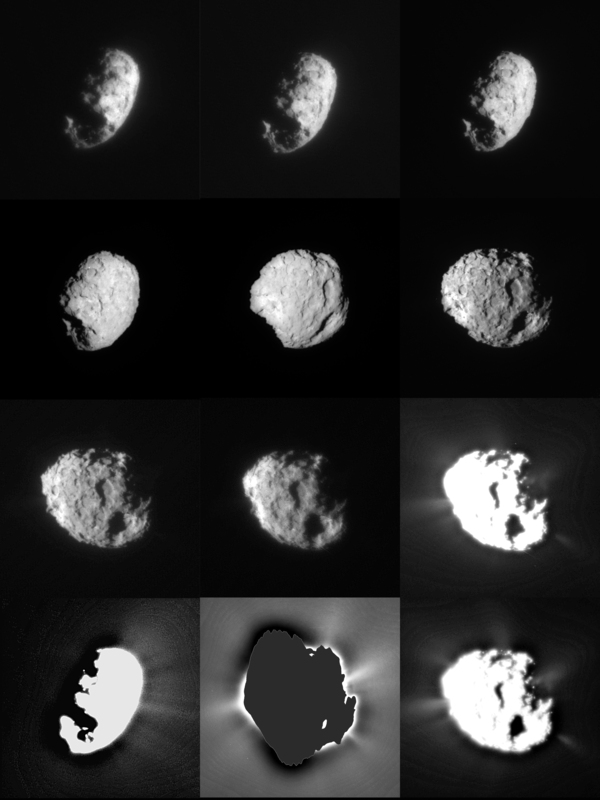 Images and models of the shape of asteroid (4) Vesta. 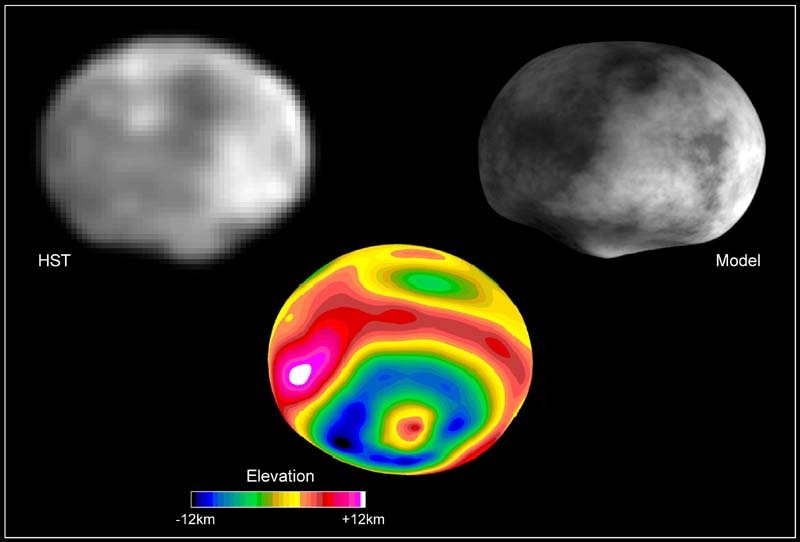 In the upper left is a real HST image, to the upper right is a model of Vesta's shape, and on the bottom is an elevation map . Credit: NASA/STScI. Vesta starts the month at magnitude 6.2 and steadily fades to mag 6.8. Sixth magnitude is close to the brightest Vesta can get and is easy for binocular observers. If you are lucky enough to be located in a very dark rural site you may even be able to see Vesta by naked eye among the stars in the ‘sickle’ of Leo. Herculina is a stoney S-type asteroid with a run-of-the-mill albedo of 16%. Though one of the brightest asteroids in the Main Belt, it avoided discovery for a century after the first asteroids were found (being found in 1904). As a result, this is the highest numbered asteroid that is relatively easy to see with a backyard telescope. In March Herculina is at opposition and is between magnitude 8.8 and 9.0 for the entire month as it travels among the stars of Coma Berenices. 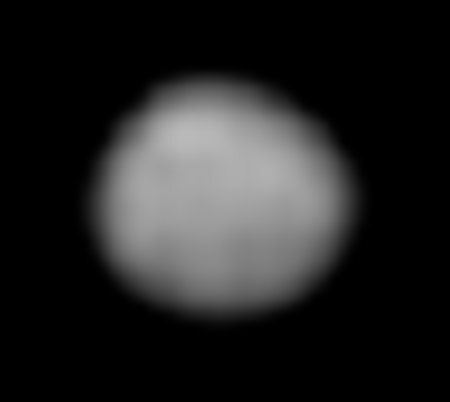 HST Image of asteroid (2) Pallas. Credit: NASA/STScI. This month it brightens from magnitude 9.0 to 8.7 over the course of the month as it travels north through the constellation of Serpens. On March 8, 2010 a mysterious explosion shook windows and many people across Northern Louisiana. It was investigated but nothing on land or in the sky offered an explanation to what could have made the “BOOM!” Local Meteorologist and Law Enfocement could only make a guess to what caused the occurance, a “Sonic Boom”. Local news reported people seeing a large gray mass moving across the sky and showed a mysterious blue halo in Georgia’s sky. Could these two have been related? Did a meteor pass through the atmosphere and cause this “Boom”? A sonic boom like the one you heard could easily have been made by a large meteor. Most meteors are small (the size of dust) and burn up at high altitudes (60 miles up). Larger meteors may survive to reach the ground. In these cases, the meteorite pieces cause a sonic boom as they slow from supersonic to subsonic speeds. Since these booms are caused close to the ground (only 5-10 miles up) they can really shake things up. We had a similar meteor fall here in Tucson last summer. A glowing cloud was seen to the west of Georgia that evening. The picture can be seen here: http://www.thenewsstar.com/article/20100311/NEWS01/3110332. This sort of cloud is also consistent with a large meteor breaking up in the atmosphere. Was it cloudy that night over LA? If the clouds were think enough it’s possible the fireball would only have appeared as a dull glow moving behind the clouds. Though I’d feel more certain if a few bright fireball reports surfaced, my feeling is the sonic boom was probably meteor related. The explosion happen around 2pm on a very cloudy day and was heard in Texas, Louisiana and Mississippi. I also believe that it may have been a meteror. Since it was daylight and cloudy it would have been difficult to see. News reports at first said it may have been a natural gas pipe explosion but no evidence of this has been found. I would think that a explosion that happen on the ground that was felt for more than 300 miles would not be hard to find. Other reports believe that it may have been a jet that cause the sonic boom. Having been in the military and hearing many sonic booms from jets, I can say this boom was far more louder than any I have ever heard. I would like to know if anyone else has any theories to what it may have been. wednesday may 12 i noticed what i thought to be venus in the sky around 8:38 in the evening as it got darker i took more pics and about 9:37 i snapped a pic showing the planet, at 938 to snapped another pic and this time it showed 2 objects, venus and right below it another object that seemed to be moving with a little tail on it. at 939 i took another pic that showed the two objects but the bottom one was no almost parrallel with im assuming venus. i waited until 954 and took another shot at an object i thought to be venus it was brighter than i had ever seen it, looked almost like a straight line of light, when observing the pics you can see two objects almost like binary stars close together, then about 20 seconds later i snapped another pic and could now only see venus and no other objects. Any astrnomers out there that could look at these pics to tell me what is going on. i would be happy to send these photos to you they are about 2 mgs each.